The #DirtyBootsChallenge was created in Hiroshima 9/2014- inspired by the thousands of people in the city who have been volunteering at the landslide disaster of 8/20/2014 that took 72 lives and destroyed the homes of more than 800 people. I think we can find hope and inspiration even in times of great sadness and loss, it helps us move forward and become a stronger community. I hope this fun challenge can be a positive way of extending the powerful spirit of teamwork we have seen here in Hiroshima to help and inspire people all over the world. In hopes of extending this passion for helping a community, the #DirtyBootsChallenge was born. Please upload your photos and/or video clips from a volunteer project in your community (no matter where in the world you are) and join in the fun! No matter where you live, isn’t there some way to help those around you- what’s missing? What’s broken? What’s dirty? What’s needed? It could be as simple as planting flowers at your local park or street corner, doing chores for an elderly neighbor, sweeping up your local playground, handing out drinks at a local sporting event, anything goes. Feel free to use this “DirtyBootsChallenge original track “Mud” donated to this campaign by long-term Hiroshima resident & musical genius DJ Windcheater. Tell us and your family/friends about it on facebook, twitter, instagram and other social media. 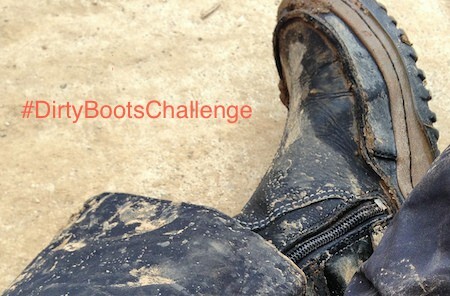 Use the tag #DirtyBootsChallenge and if you like- add a little dance & add the tag #DirtyBootsDanceChallenge . If you’re in Hiroshima, please add the tag #gethiroshima or send us the link to [email protected] and we will promote our favorites on our twitter feed and Facebook page. Ask your friends and family around the world to do the #DirtyBootsChallenge or #DirtyBootsDanceChallenge too! Why create the #DirtyBootsChallenge ?? The #DirtyBootsChallenge was created in Hiroshima 9/2014- inspired by the thousands of people in the city who have been volunteering at the landslide disaster of 8/20 that took 72 lives and destroyed the homes of more than 800 people. I think we can find hope and inspiration even in times of great sadness and loss, it helps us move forward and become a stronger community. I hope this fun challenge can be a positive way of extending the powerful spirit of teamwork we have seen here in Hiroshima to help and inspire people all over the world.